How does the mobile version of this seminal RPG classic stack up? After an extremely long and excruciating wait for Western RPG fans, Beamdog has finally made Icewind Dale: Enhanced Edition available for iOS. The enhanced re-release of the classic from 2000 has seen several road bumps on its way to release, but now it's finally out. Is it worth revisiting? The short answer is "yes." If there's a chance you happily lapped up the Dungeons and Dragons-styled goodness of the original PC game back upon its inception, you'll no doubt fall in love immediately with this decadent and feature-rich port. It's fabulous from the ground up even despite some issues with sprite work looking a bit muddy. Excavating monster-infested ruins, dungeons, and other areas is just as engaging as it once was, as is the dark overtones and drama involved with your party as they venture across the Spine of the World. It's a linear tale told through dungeon crawls that give the game a decidedly more epic lilt than the game's contemporaries, especially given the fact that it has less leeway to do so and, upon its inception, less resources than today's titles. It still manages to tell one heck of a story with new quest lines, additional items and spells, new class kits, and "Story Mode," which allows players to progress through the story if that's all they're interested in with quicker leveling and freedom from the burden of death. There are some issues with slowdown in some areas, and as previously mentioned the graphics could be a bit tighter and more crisp, but those are minor nitpicks and hardly detract from the overall experience. 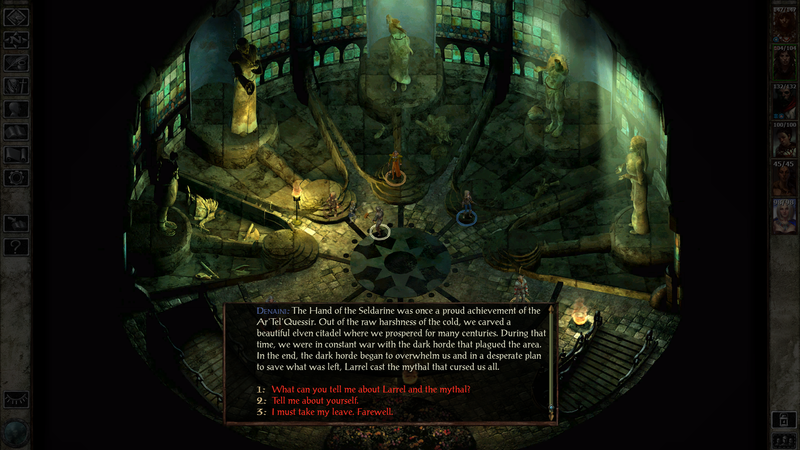 Icewind Dale: Enhanced Edition is one of the best RPGs you'll be able to find on iOS (or elsewhere for that matter) and for $10 you're delivered a ridiculous amount of content in a gorgeous package. If you've never tried it out, now is the best time to give it a whirl. Download Icewind Dale: Enhanced Edition for iPhone, iPad, and Android.